As you know, I’m quite passionate about Arachnology, from spiders, to harvestmen and Pseudoscorpions. These are all some of the creatures that fall into the category of the ‘obscure and amazing‘. On the topic of pseudoscorpions, a few very fun and interesting things have happened recently, and enough to warrant a short blog post. I also promised that I would post a few more videos related to some research activities on the hunt for pseudoscorpions in the Yukon. 1. 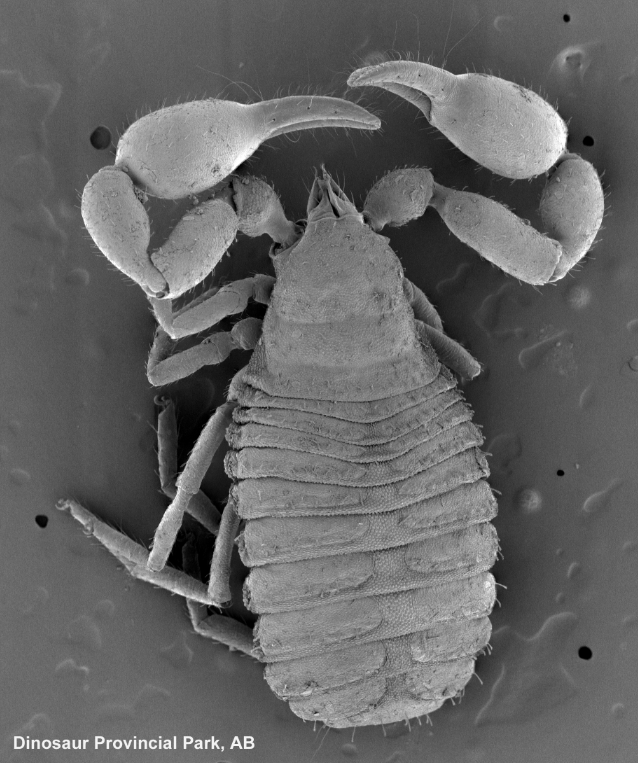 Just look at this SEM of a pseudoscorpion! There really is something lovely about getting up close and personal with these little Arachnids. I don’t know this species, but it’s definitely in the family Chernetidae – a relatively diverse family, quite common across Canada. My favourite Yukon species, Wyochernes asiaticus, is also a Chernetid. Dave Walter really does some magic with his SEM images, and you are encouraged to check out is macromite blog (his home bug garden blog is also worth a peek!). 2. Just look at these videos about collecting pseudoscropions in the wild! 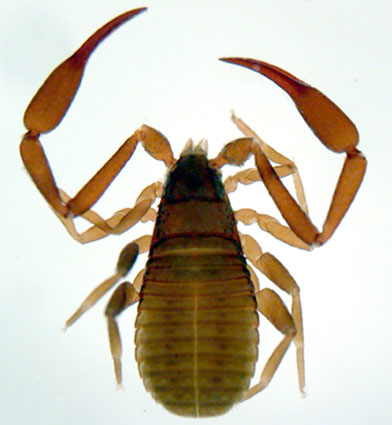 Typically, pseudoscorpions are not that commonly encountered. In my experience, when they are encountered, you tend to see one or two. What is truly amazing is the sheer abundance of this species found under rocks in creek/river beds in the Yukon. Furthermore, you can see and collect multiple life stages, including females with eggs. This short video gives a taste for this abundance. The third and final video is a big goofy, and highlight the ‘collecting gear’ and appropriate field attire for becoming a “pseudoscorpion hunter“. I am continually on a crusade to help generate enthusiasm for Arachnids, whether it is dispelling myths, or trying to inspire others to become Arachnologists (you know, we do need Arachnologists in Canada!). One important caveat: you may NOT simply run to the Yukon and flip rocks to collect pseudoscorpions – many parts of the world, including the Yukon, have strict guidelines about what you can collect. Permits are required, and be sure to check into this before you plan on becoming an Arachnologist! 3. Just look at this pseudoscorpion necklace! 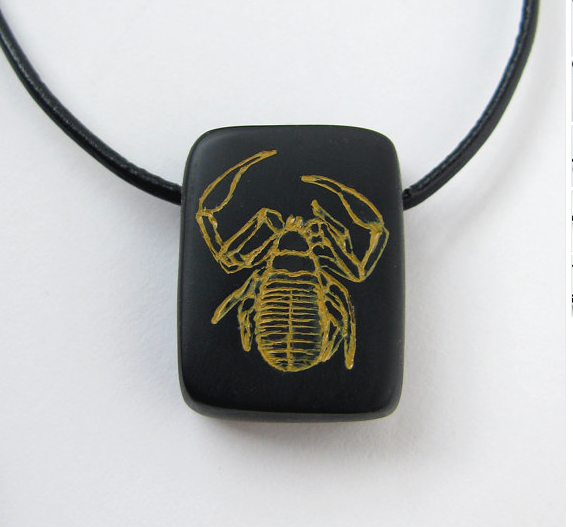 The pseudoscorpion necklace. You want one. Not only that, this design is actually from a photography I took a few years ago, and is an accurate depiction of the cosmopoliton species Chelifer cancroides. I KNOW you want to get yourself one of these… start a conversation with Lynn. Get yourself one of these necklaces and stand proud with other pseudoscorpionologists! In sum, I do hope you find this post interesting, hopefully fun, and has whetted your appetite from more information about curious critters. I have never seen a pseudoscorpion in nature. Something to look forward to. In the first video, at around 00:11-00:12, something very wierd happenes to the car. Very nice! It is so neat to see them moving around under the rock. I thank you for the kind mention, and I’m glad you like your necklace. It was easy to be inspired as they are such fascinating little subjects. Lynn – glad you liked the post! Hopefully you (and Jim) see a pseudoscorpion live someday. I just found one of these guys in my house in central Massachusetts! Took me awhile to identify it. At least I know they aren’t dangerous.